From the Editor: Sharon Maneki is president of the National Federation of the Blind of Maryland. 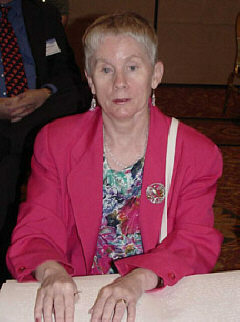 She also chairs the committee to select the Distinguished Educator of Blind Children for 2003. The National Federation of the Blind will recognize an outstanding teacher of blind children at our 2003 convention next July. The winner of this award will receive an expense-paid trip to the convention, a check for $1,000, an appropriate plaque, and an opportunity to make a presentation about the education of blind children to the National Organization of Parents of Blind Children early in the convention. Anyone who is currently teaching or counseling blind students or administering a program for blind children is eligible to receive this award. It is not necessary to be a member of the National Federation of the Blind to apply. However, the winner must attend the national convention. Teachers may be nominated by colleagues, supervisors, or friends. The letter of nomination should explain why the teacher is being recommended for this award. The education of blind children is one of our most important concerns. Attendance at a National Federation of the Blind convention will enrich a teacher's experience by affording him or her the opportunity to take part in seminars and workshops on educational issues, to meet other teachers who work with blind children, to meet parents, and to meet blind adults who have had experiences in a variety of educational programs. Help us recognize a distinguished teacher by distributing this form and encouraging teachers to submit their credentials. We are pleased to offer this award and look forward to applications from many well-qualified educators. � What are your views about when and how students should use Braille, large print, tape recordings, readers, magnification devices, computers, electronic note-takers, and other technology? * How do you decide whether a child should use print, Braille, or both? � When do you recommend that your students begin instruction in the use of a slate and stylus, of a Braille writer? � How do you determine which students should learn cane travel (and when) and which should not? � When should keyboarding be introduced? � When should a child be expected to hand in print assignments independently? * List your degrees, the institutions from which they were received, and your major area or areas of study. * How long and in what programs have you worked with blind children? * In what setting do you currently work? * Briefly describe your current job and teaching responsibilities. * Describe your current caseload, e.g., number of students, ages, multiple disabilities, number of Braille-reading students, etc.